In this article we explain the following points about hypothyroidism. Hypothyroidism is the name given when the thyroid gland works poorly, producing fewer hormones than needed to control our metabolism. Hypothyroidism is the most common disease of the thyroid. 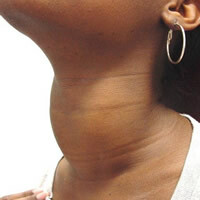 The thyroid (or thyroid) is a butterfly-shaped gland which is located at the base of the neck below the larynx. The thyroid produces two hormones, triiodothyronine (T3) and thyroxine (T4), which act by regulating our metabolism, i.e. the way the body uses and stores energy. Hypothyroidism is the name given when the thyroid gland produces an insufficient amount of these hormones. To understand how hypothyroidism appears you need to know how the thyroid works. The mechanism explained below seems complicated, but it is not. Read carefully, because it's good explained. 1. As just said, the thyroid produces two hormones that control our metabolism, called T3 and T4. 2. The pituitary gland, located at the base of the brain, controls the degree of production of T3 and T4 by the thyroid gland through a hormone called TSH (Thyroid Stimulating Hormone). When there is little circulating thyroid hormone, the pituitary gland increases the secretion of TSH, giving order to increase production of T3 and T4 by the thyroid. When there is too much circulating hormone, the pituitary TSH secretion decreases, discouraging the thyroid to produce T3 and T4. Thus, the body can maintain stable levels of T3 and T4, keeping our metabolism controlled. The Hypothyroidism can be caused by a thyroid problem that prevents the secretion of its hormones (primary hypothyroidism) or by a problem in the pituitary gland to inhibit TSH secretion, thereby inhibiting the production of T3 and T4 (secondary hypothyroidism). Therefore, primary hypothyroidism occurs by default in the thyroid and secondary hypothyroidism is the defect of pituitary gland. When the problem is in thyroid while producing the hormones, the pituitary gland gradually increases its production of TSH to try to overcome this deficit. 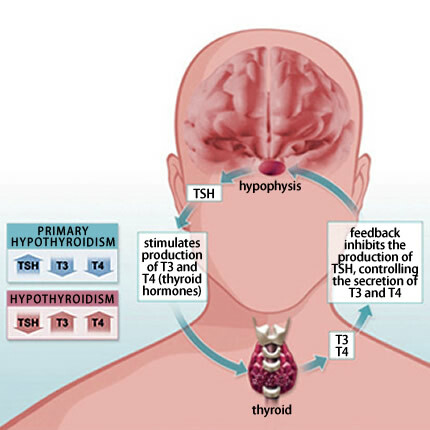 Therefore, in primary hypothyroidism the low T4 and elevated TSH are found. If the problem is in the pituitary, we find a lack of TSH secretion and also a low T4 for lack of stimulus for their production. 95% of cases of hypothyroidism are primary. The main causes are Hashimoto's thyroiditis, surgical removal of the thyroid (thyroidectomy) and the destruction of the gland by irradiation. Hashimoto's thyroiditis is an autoimmune disease, which occurs due to destruction of the gland by our own antibodies. Hashimoto's thyroiditis is the main cause of hypothyroidism. It is seven times more common in women and has a clear family relationship. For reasons still unknown, our body starts to produce antibodies against the thyroid gland itself. The destruction process is slow and takes several years. As thyroid cells are being destroyed, the gland's ability to produce T4 and T3 will fall. Noting that there is a drop in the levels of thyroid hormones, the pituitary gland increases the secretion of TSH, stimulating the cells that still exist to increase its production of hormones. This increase in TSH is sufficient to normalize the levels of T3 and T4. Therefore, in the early stages of Hashimoto's patients have no symptoms, since blood levels of T3 and T4 are normal. However, the blood tests can detect a TSH higher than normal. This phase is called subclinical hypothyroidism. As more cells are dying, more TSH is being secreted by the pituitary gland, to the point that the remaining cells are so few that they can no longer produce T3 and T4 required to maintain a desired blood level. When thyroid hormones are at low levels, symptoms of hypothyroidism appear. The name thyroiditis is given because the action of thyroid antibodies cause irritation. It is possible that the patient develops hyperthyroidism in the early stages, since the gland can get irritated to release more hormone than the desired. The patient may present with hyperthyroidism initially, and only in advanced stages go on to have hypothyroidism. Hypothyroidism leads to weight gain, but DOES NOT CAUSE OBESITY. It is very common for people to justify their obesity by hypothyroidism, when in fact this condition leads to a gain of only a few pounds, 5 or 6 at most. Furthermore, the weight gain comes out in large part by fluid retention and not fat gain. Nobody gains enough weight to become obese just because they're hypothyroid. Obesity occurs only in those patients who were already in a state of overweight before, now close to being obese. In children hypothyroidism leads to a framework of low growth and mental retardation called cretinism (hence the origin of the word idiot). 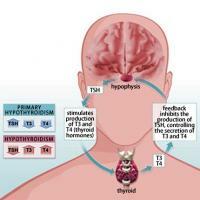 Thyroid hormones are essential for brain development. The screening test is used to diagnose hypothyroidism in newborns. Hypothyroidism caused by removal or irradiation of the thyroid has the same symptoms of hypothyroidism caused by Hashimoto's thyroiditis. The difference is that its onset is abrupt because of removal of the thyroid, and slow and progressive in Hashimoto. Another cause of hypothyroidism is iodine deficiency, a substance necessary for the production of hormones. Today there is supplementation of iodine in table salt; this type of hypothyroidism is rare in urban areas. Some medications such as amiodarone, interferon and lithium can also cause changes in the functioning of the thyroid, causing hypothyroidism. Diagnosis is made by serum TSH, free T4 and thyroid antibodies (anti-TPO and anti-thyroglobulin). In general, the Hypothyroidism is diagnosed to patients with symptoms of hypothyroidism having TSH greater than 4 mU/L. There is also a group falling within the definition of subclinical hypothyroidism, or TSH greater than 4 mU/L, but without symptoms. In the latter case, the treatment is only necessary if the patient has high blood cholesterol, and TSH, greater than 10 mU/L, when the patient is pregnant or has positive thyroid antibodies (anti-thyroglobulin, anti-TPO). The presence of anti-TPO or anti-thyroglobulin antibodies in a patient with hypothyroidism indicates that the cause is Hashimoto's disease. Today, thanks to the identification of subclinical hypothyroidism, we are able to diagnose the disease before clinical signs of it. One of the first changes is the elevation of cholesterol, which may precede by years the onset of frank hypothyroidism. Attention, there is hypothyroidism with normal tests results. If you think you have symptoms of hypothyroidism, but your TSH and T4 are normal, your complaints have another cause. All patients above 50 years should have their TSH measured, even if there are no symptoms of hypothyroidism. If there is a positive family history, screening may begin at the age of 35, especially in women. There is no cure for Hashimoto's disease, but fortunately there are synthetic thyroid hormones. The treatment of hypothyroidism is the simplest way of daily administration. 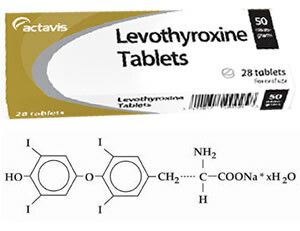 The drug used is usually Levothyroxine (Puran, Synthroid, Letter), which is a synthetic T4. The levothyroxine is administered once per day and should always be taken on an empty stomach (1 or 2 hours before eating). The goal of treatment is to keep the TSH within the normal range, which varies between 0.4 and 4.0 mU/L. For this, your doctor may have to change the doses of the drug from time to time. The dosage of the tablets is in micrograms of levothyroxine and not in milligrams, as most drugs. Therefore, levothyroxine should not be made in the pharmacies to prevent errors in dosing. Symptoms usually regress with already two weeks of treatment. The goal is to keep the patient with normal TSH and free of symptoms. Treatment is long-life and cannot be stopped. There is no doubt that patients with elevated TSH and symptoms of hypothyroidism should be treated with hormone replacement. The question arises in cases of subclinical hypothyroidism. In this group, the treatment is only necessary if the patient has high cholesterol, TSH greater than 10 mU/L, if the patient is pregnant, or has positive thyroid antibodies (anti-TPO and anti-thyroglobulin). My daughter is 31 years old. When she was 16, she was diagnosed autoimmune hypothyroidism. Since then, she takes pills every day. She takes the levothyroxine. The drug helps to cope with the disease. If she accidentally forgets to drink a pill - at once she feels bad. Why is it not written on the impact of thyroiditis on pregnancy? Will the disease cause changes in the fetus and what should be done to prevent it? My son was diagnosed hypothyroid and he was appointed L-thyroxine. I give him 50mg/day: Is there a chance that the child gets better and the does not have to take medication any more or is it a disease for the rest of his life?